You all might have read my last post on facebook’s new social email/messaging system. The facebook social messaging is available now only through invitation basis . Also facebook has provided an option which would allow us to set up our @facebook.com email address , this privilage is available only when you get approval to the facebook’s new social messaging system. I was waiting for their approval for over 2 weeks and now I got my hand on the new facebook message. Today I set up my @facebook.com email address too.But the messaging is far more better than i expected. Really nice piece of work by the facebook team. To set up a free @facebook.com address, go to your Messages view and click the “Claim your Facebook email” link. If you don’t have a username yet, you can choose one when you create your email address. Once you set up your email address, people can email you using any traditional email system (e.g., Hotmail, Yahoo or Gmail), and the emails will be delivered to your Facebook Messages. When you send messages to external email addresses, the emails will be formatted to look like Facebook messages, including your name, your profile picture and your message. If the person replies to the message it will be stored in facebook messages just like a chat history. Even the new messaging system and the facebook chat are interconnected, whatever conversation you do in facebook chat that are send during the time you are offline as well as online will be stored in facebook new message inbox. 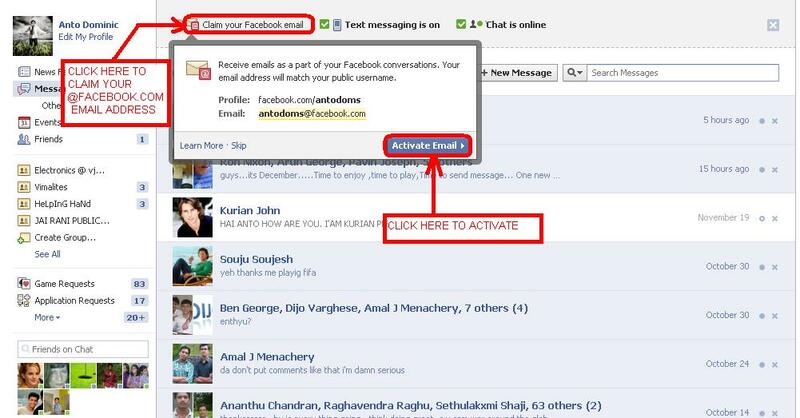 You can send messages to other email system(like gmail,yahoo,aim,etc..) from your facebook’s new message.